Now that the dust has settled over the all-female Ghostbusters reboot, it’s time to turn our attention to the woman-led Ocean’s Eleven spin-off that Warner Bros. has quietly been putting together while we were otherwise distracted by the debate over whether or not ladies can bust ghosts (talk about misdirection). News of the film broke last fall, when it was first suggested that the George Clooney-led caper would be reimagined as one with Sandra Bullock as the smooth operator. Since then, rumors have swirled about Cate Blanchett’s involvement alongside a casting announcement for Mindy Kaling and Helena Bonham Carter. Additionally, we learned that the film would be titled Ocean’s 8, and that the grifters would organize their very own heist instead of recreating the various Vegas thefts of Danny Ocean and the other ten guys that made up his crew. Instead, Bullock will play his sister, who also happens to have been recently paroled. 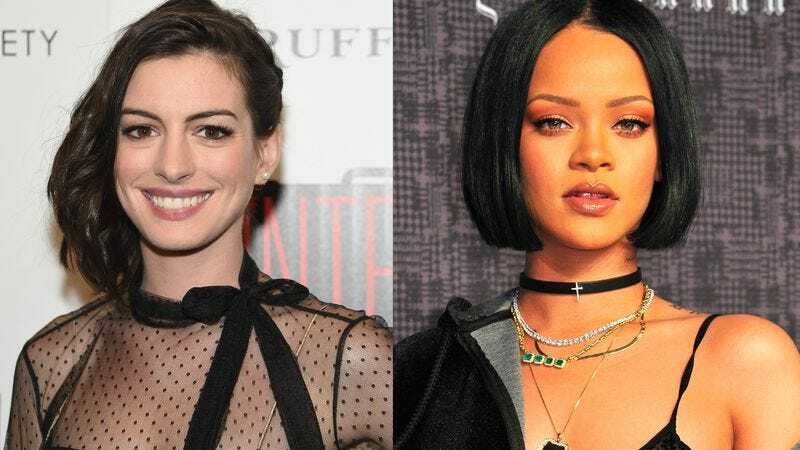 Now Deadline reports that the team she’s put together will include Blanchett, Kaling, and Bonham Carter, as well as Anne Hathaway, Rihanna, and Awkafina (a.k.a Nora Lum). There’s no word on their roles yet, of course, but filming is scheduled to begin this October. Director Gary Ross is still one con woman shy of the figure in his movie’s title, but we doubt he’ll find it difficult to attract another star given the constellation that’s already in place.